In this week’s midway results announcement, Yoshikitty achieved #1 in the regional rankings in five countries (South Korea, China, Italy, Germany, and France), scoring #1 on Rakuten Ichiba’s official Sanrio shopping site “Sanrio Zone” and #3 overall worldwide. Only 20,000 total votes separate the top 3 characters, with the remainder of the 100 eligible characters trailing by large margins. Yoshikitty, the first Sanrio character based on a living person, has surpassed even the original Hello Kitty character in this year’s voting and has strong momentum leading into the final weeks of the contest which ends June 11. Final results will be announced at Sanrio Puroland on July 1. 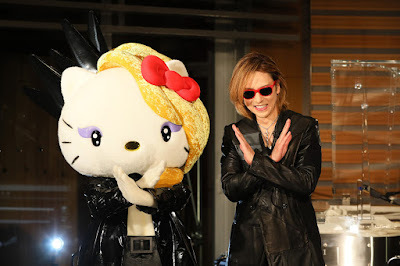 YOSHIKI aims to have the character rank first this year, with the help of powerful backup from fans across the globe who can vote daily to support the spiky-haired, headbanging rock star of Sanrio’s lineup. YOSHIKI also created the “Hello Kitty Theme Song”, titled “Hello, Hello”, which was dedicated to the late Sanrio VP Kunihiko Tsuji. The “Sanrio Character Ranking Contest”, held for the 33rd time this year, is a month-long voting event featuring the top 100 Sanrio characters selected out of more than 450. Every year, Sanrio fans wage a fierce battle in order to achieve victory for their favorite. Yoshikitty placed 12th in 2015, when she was featured in the contest for the first time, and 7th in both 2016 and 2017. She has succeeded in ranking in the top 10 for 2 consecutive years alongside very popular characters such as Pom Pom Purin, My Melody, and the original Hello Kitty. Yoshikitty’s popularity has been increasing yearly, and she continues to establish herself more and more as a prominent Sanrio character.